I had some time Friday afternoon before sunset to take some photos. 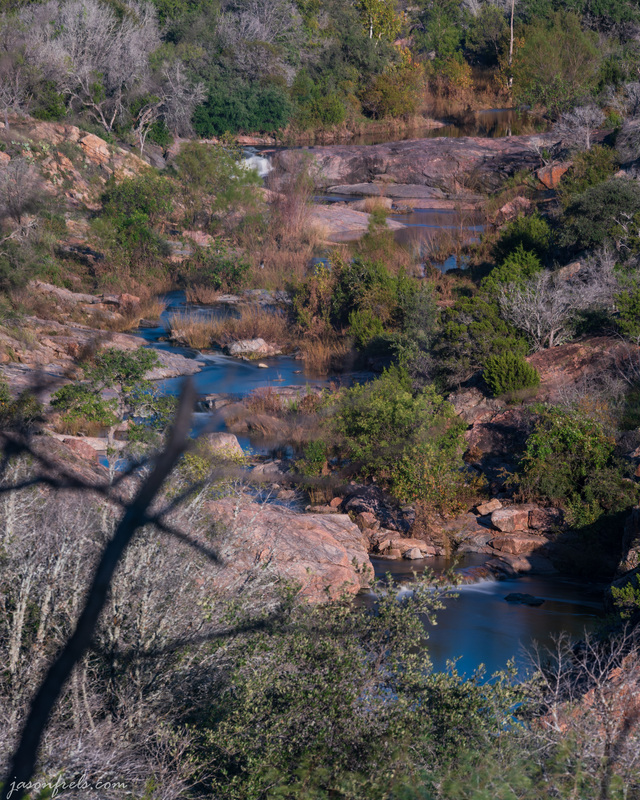 It had been raining a lot and I wanted to go to Inks Lake to try to take pictures of the waterfall as I thought it might be flowing heavily. When I got there I found that the park was closed because of flooding, though I could see that it was not actually flooded. So, I ended up at a highway overlook of part of the park to see what I could manage. I could just see parts of the waterfall from this location, though it was difficult through the trees and quite far away. 200mm is the longest lens that I have so I mounted that to the tripod to see what I could get. I decided that I wanted to try to shoot in portrait mode to get as much of the waterfalls as I could get. To do this, I used a recently acquired right-angle bracket to mount to the tripod head. Ideally, this should allow you to quickly switch between landscape and portrait orientation when shooting photos. See the picture below showing the right-angle bracket attached to the tripod shoe of my lens. For whatever reason, I find this adapter very stubborn when attempting to attach it to the tripod. 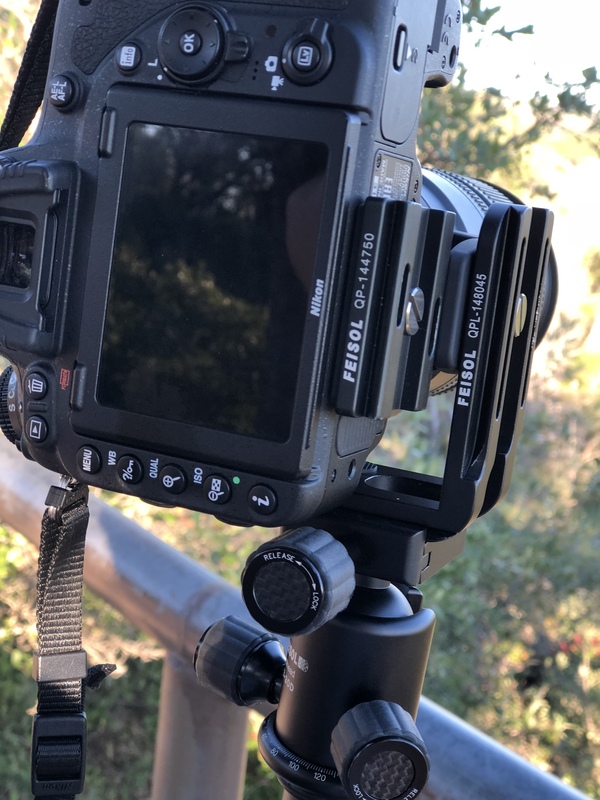 It is the same brand as the tripod head, but it is not a great fit when in portrait mode and I have to wrestle with it a bit. Below is the best view I was able to get of the waterfalls. There was a lot of water flowing and I could hear it from up where I was. I had hoped to be down on the large rocks directly downstream of the main waterfall in the distance with a much wider lens. But I did get some water motion blur at various points along the water fall. See the image below. The above was shot at 200mm through a 10-stop ND filter and a circular polarizer. One challenge I had was getting the camera stable enough to set and lock the focus. I was using live view and zooming in to the distant waterfall to set focus and the camera would shake every time that I touched it. When taking the final picture I used a remote control shutter release. This allowed me to reduce camera shake to the minimum by first locking the mirror up, then waiting a few seconds for the camera to be still, and then releasing the shutter for the long exposure. 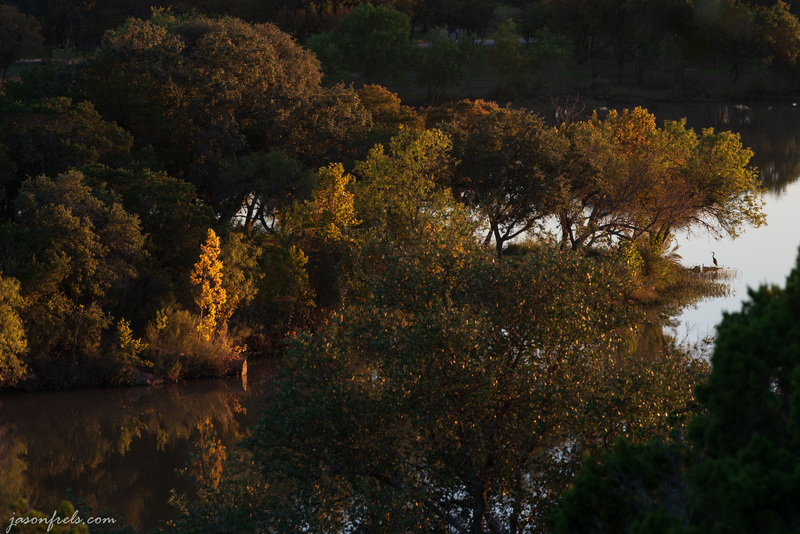 After experimenting with the waterfall, I did notice that there was the beginnings of some fall foliage at the lake and the evening sun was bringing out the warm tones. 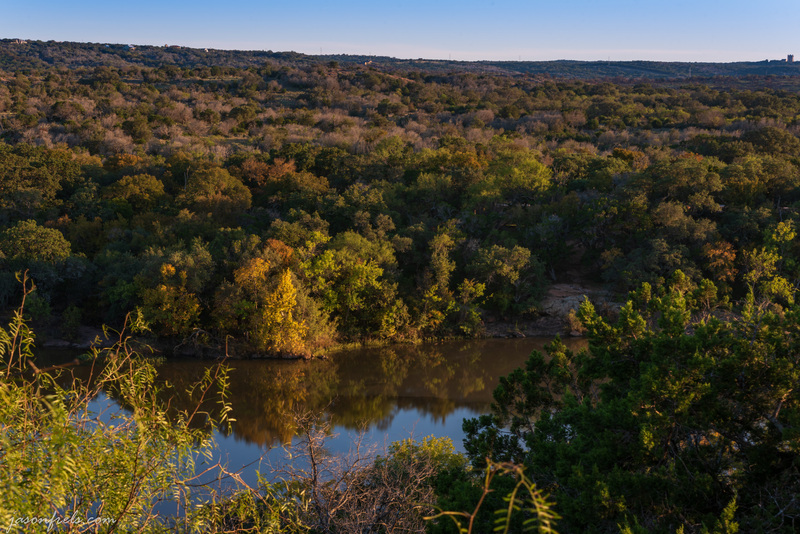 So I set about trying to find a few details to photograph from this overlook. The image below shows a particularly bright tree next to the lake. I was hoping for a nice reflection in the water if I could shoot around the foreground trees. This was a 60 second exposure timed on my phone. There was no wind, so I didn’t really get any camera shake and the water was relatively smooth to begin with. I got some reflection, but I really wanted to be down on the shore directly across the water. Maybe in a week or two when the park re-opens. As the sun neared the horizon, there was one particularly bright tree that seemed to catch a beam of sunlight. I focused on trying to make something work with this tree. In the following picture I was focusing on the tree, but when I got back home to edit the image, I found that a wading bird is also hanging out in the right side of the frame. With this image, I did bring up this tree a little in Lightroom to make it stand out. I also cropped in just a little bit to frame the bird and remove some distractions. I like the way this photo turned out. With the sun setting on a clear sky, I headed back home as I knew that there would be no cloud show. I didn’t get to shoot where I wanted, but I tried to make the best with the vantage point I had.